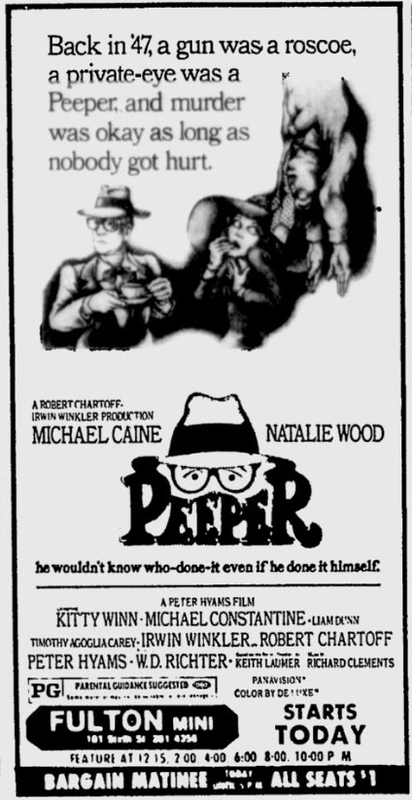 Peeper is a fantastic film from 1975, somewhat of a riff on the The Big Sleep, starring Michael Caine and directed by Peter Hyams. Apparently, it's not a hugely popular movie and I have no idea why that might be...it is seriously well done and entertaining, not to be missed. I've been completely baffled and unswayed by some of the mediocre and bad reviews (contemporary and current) that I've had the misfortune to come across. The female lead in Peeper is played by Natalie Wood, who wasn't doing much on-screen in the mid-'70s and came out of nowhere to absolutely nail her role. She is wonderful in this film and, since her character is obnoxious, she had to play it just right...and she does. Backing up Natalie Wood as the second leading lady was Kitty Winn, who also turns in a great performance. Of course, she doesn't have nearly as many scenes as her co-star but she still manages to make a big impression on the viewer.